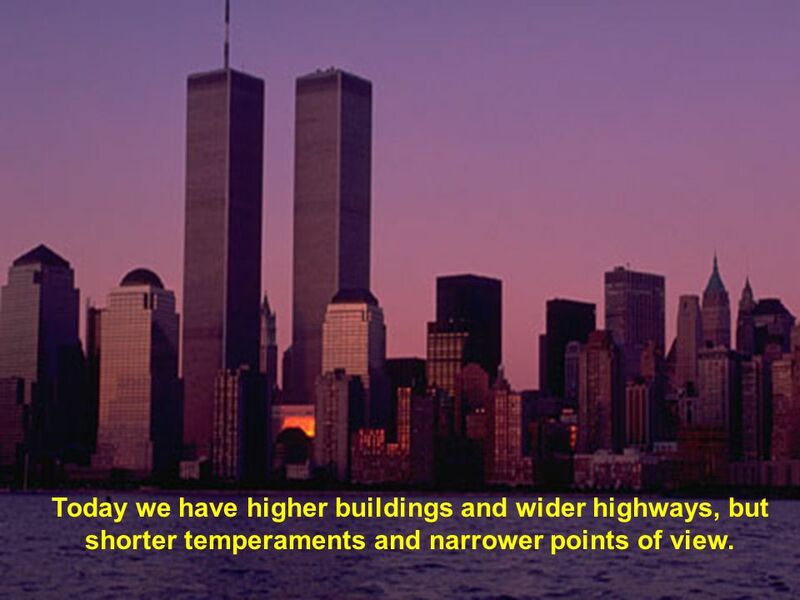 2 Today we have higher buildings and wider highways, but shorter temperaments and narrower points of view. 3 We spend more, but enjoy less. We have bigger houses, but smaller families. We have more compromises, but less time. We have more knowledge, but less judgement. We have more medicines, but less health. 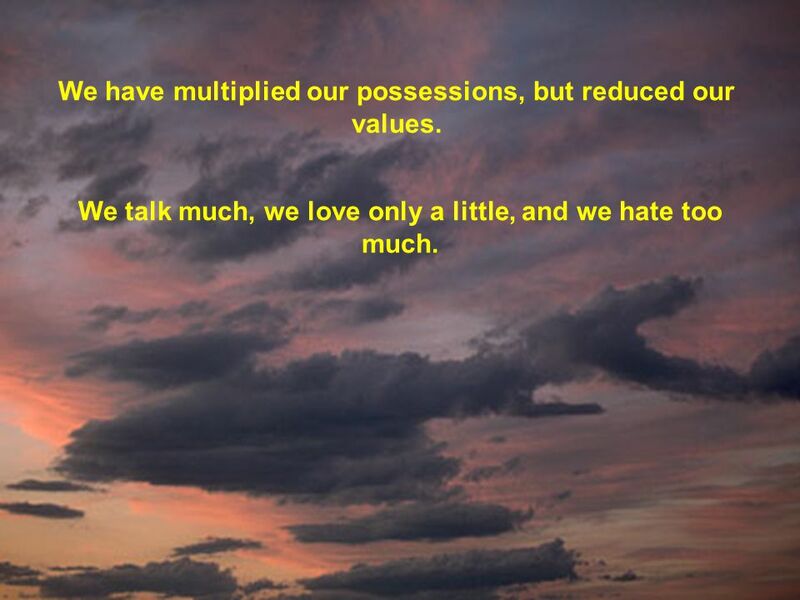 4 We have multiplied our possessions, but reduced our values. 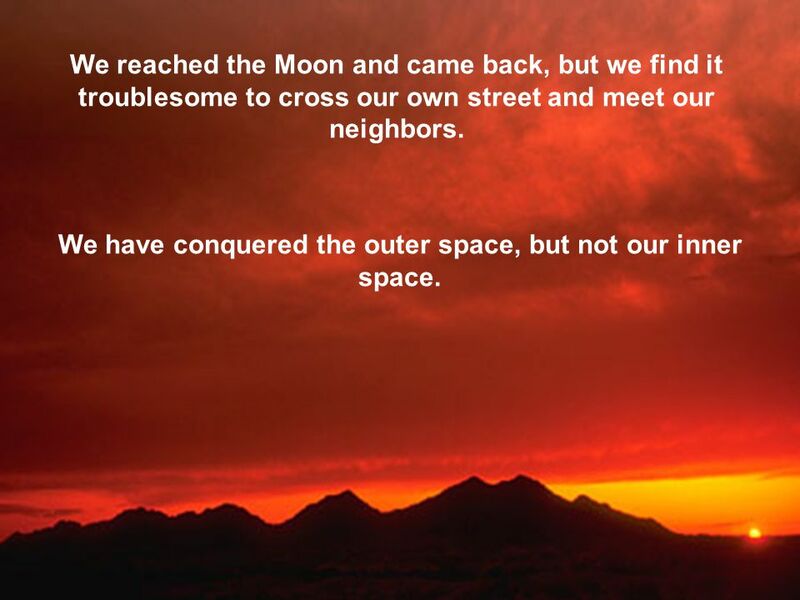 5 We have conquered the outer space, but not our inner space. 6 We have higher income, but less morals. These are times with more liberty, but less joy. 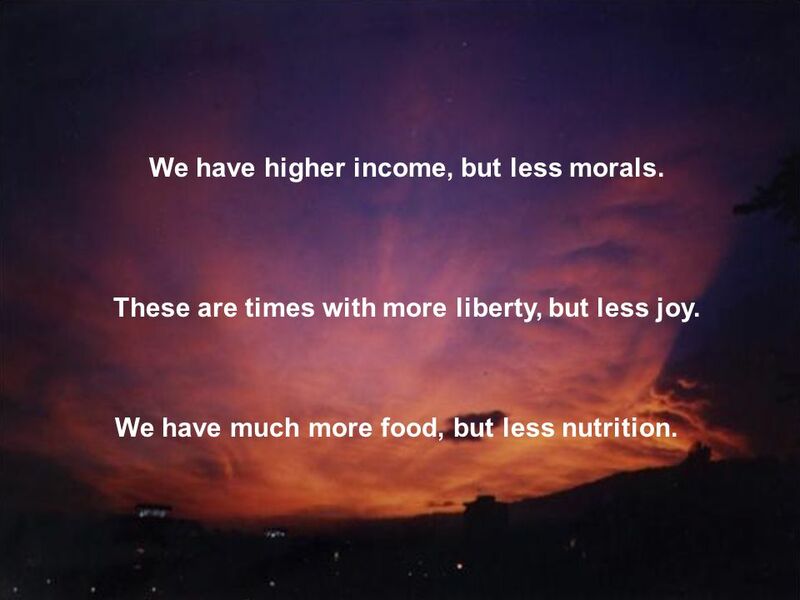 We have much more food, but less nutrition. 7 These are times of finer houses, but more broken homes. 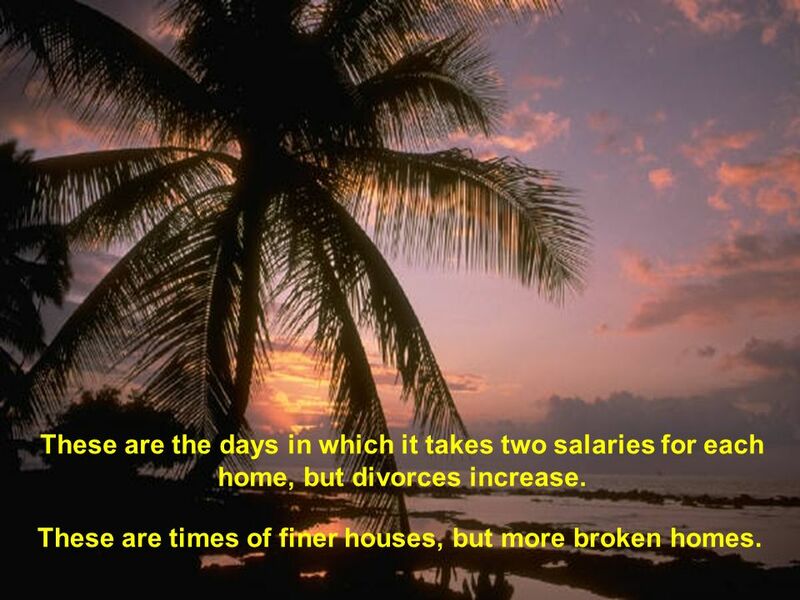 These are the days in which it takes two salaries for each home, but divorces increase. These are times of finer houses, but more broken homes. 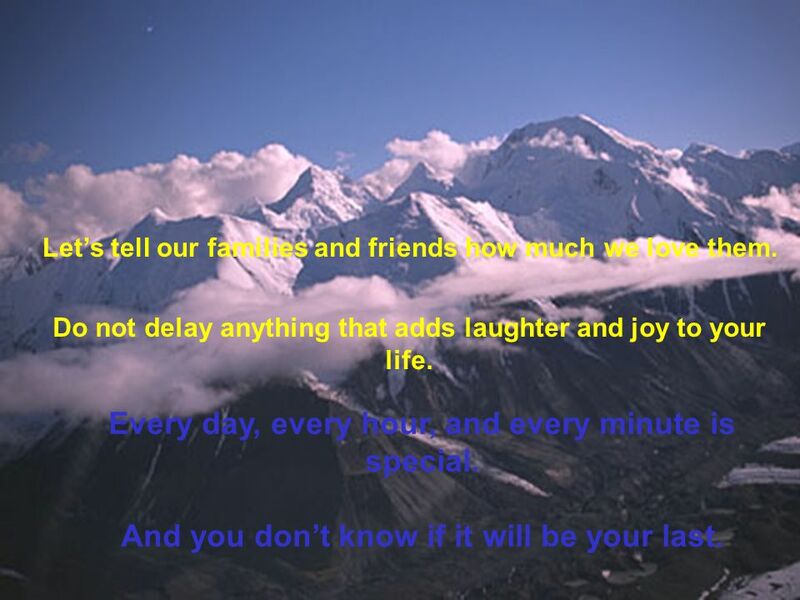 9 You do not keep anything for a special occasion, because every day that you live is a special occasion. 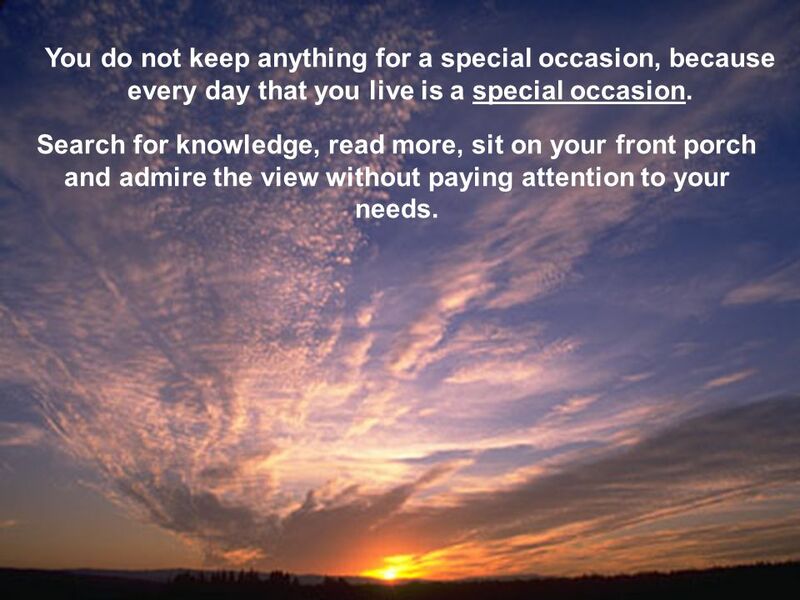 Search for knowledge, read more, sit on your front porch and admire the view without paying attention to your needs. 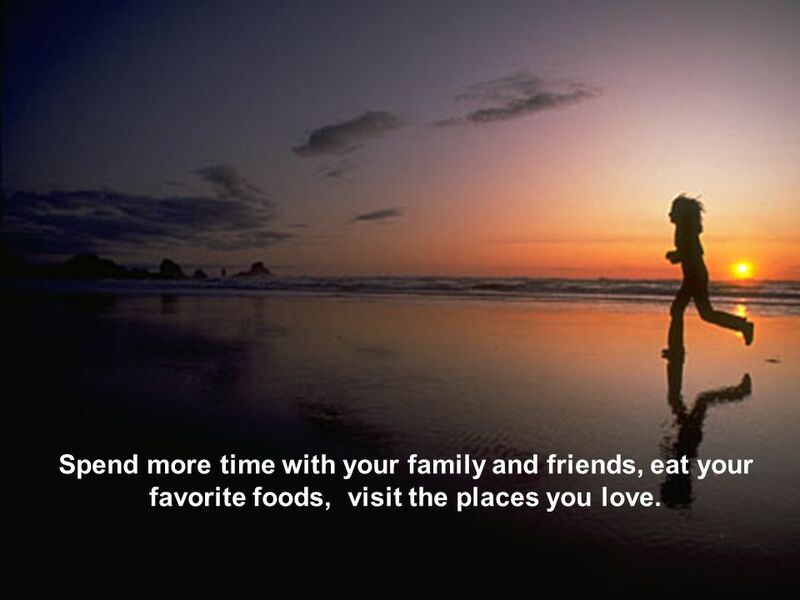 10 Spend more time with your family and friends, eat your favorite foods, visit the places you love. 詩 90:12 求你指教我們怎樣數算自己的日子， 好叫我們得著智慧的心。 Ps 90:12 So teach [us] to number our days, that we may apply [our] hearts unto wisdom. 12 Let’s write that letter we thought of writing “one of these days”. 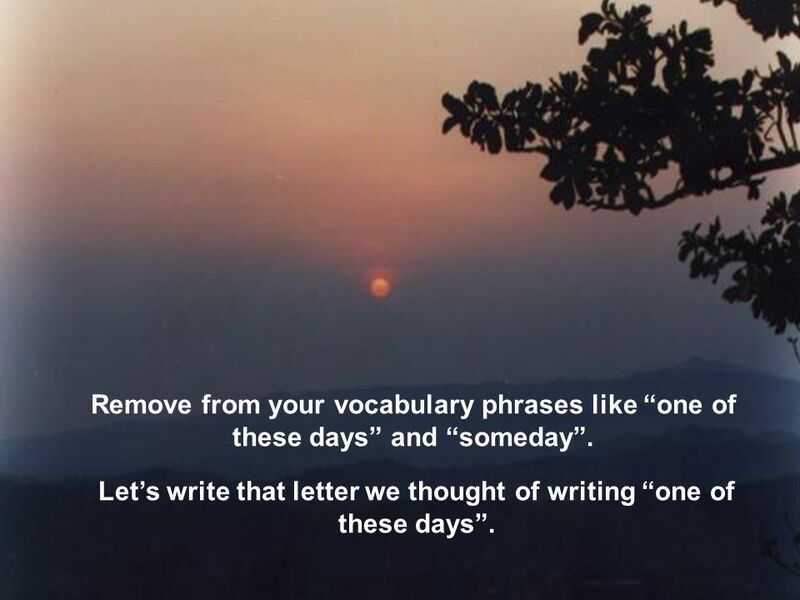 Remove from your vocabulary phrases like “one of these days” and “someday”. Let’s write that letter we thought of writing “one of these days”. 13 Every day, every hour, and every minute is special. Let’s tell our families and friends how much we love them. Do not delay anything that adds laughter and joy to your life. Every day, every hour, and every minute is special. And you don’t know if it will be your last. 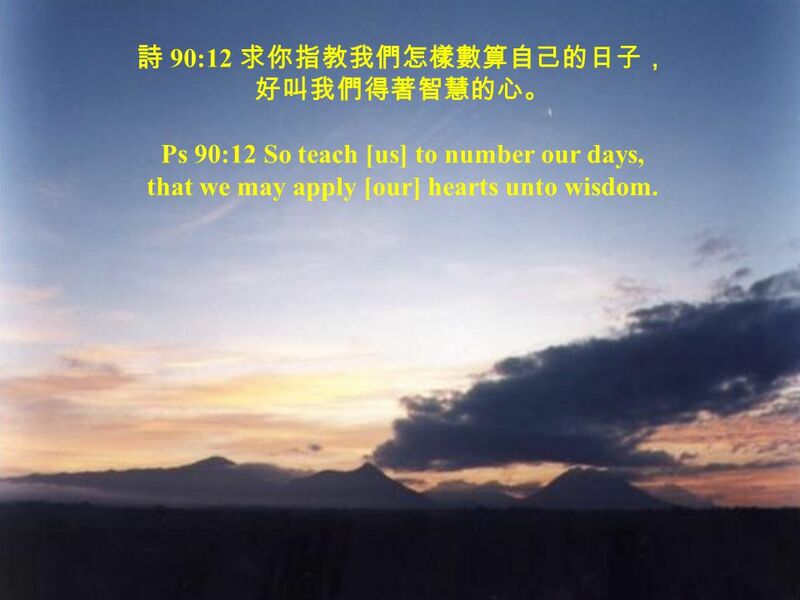 14 Heb 3:13 But exhort one another daily, while it is called To day. 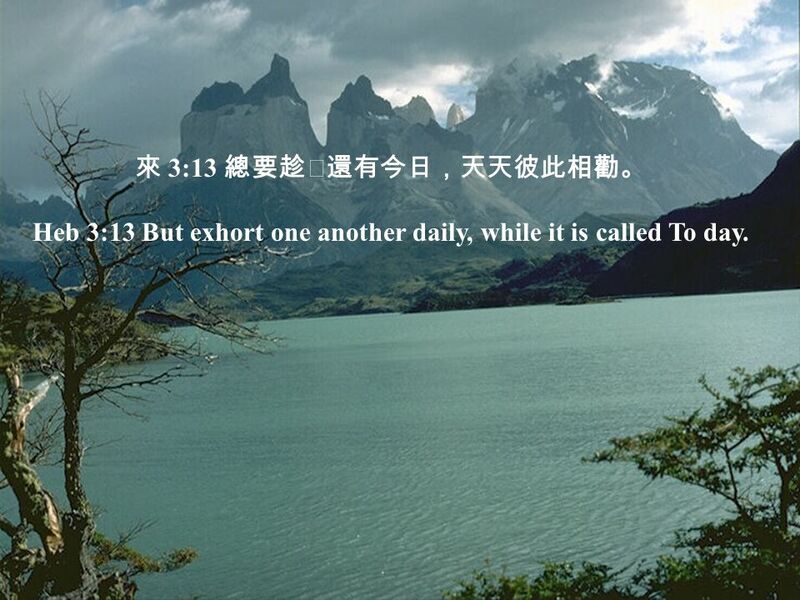 來 3:13 總要趁還有今日，天天彼此相勸。 Heb 3:13 But exhort one another daily, while it is called To day. 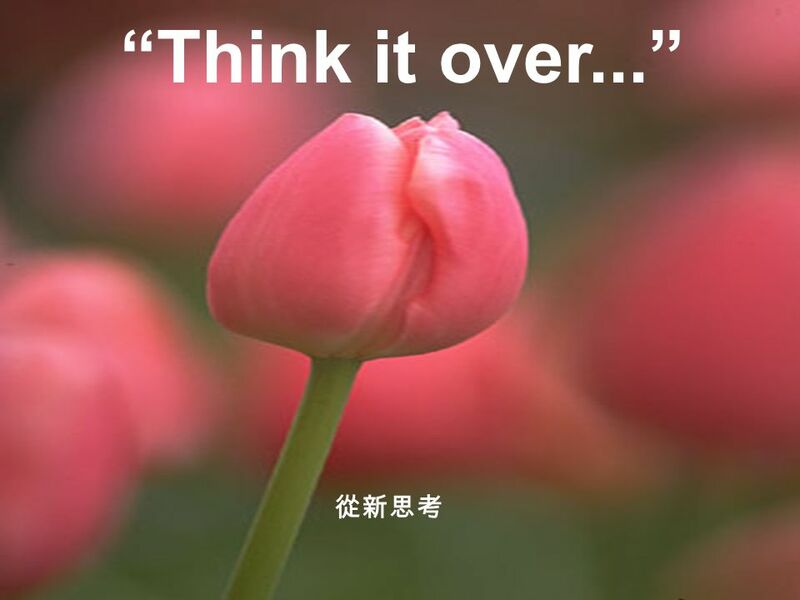 Download ppt "“Think it over...” 從新思考." Paradox Of Our Times Click for Next Slide . How to make the welcome real Engage People to Come and Stay between Christmas and Ash Wednesday. The Paradox Of Our Times Click for Next Slide Today we have bigger houses yet smaller families More convenience, but less time. Paradox Of Our Times Click for Next Slide Today we have bigger houses, but smaller families More conveniences, but less time. DINESH VORA PARADOX OF OUR TIMES IN OUR BEAUTIFUL WORLD OF PROGRESS. Love Your Heart T alks West Virginia Women Go Red for Heart Health Model Talk. Paradoxes of Our Times Click for Next Slide Today we have bigger houses and smaller families. More conveniences, but less time. Paradox of Our Times. Today we have bigger houses and smaller families More conveniences, but less time. 1 Paradox of Our Times Paradox of Our Times Paradox of Our Times. 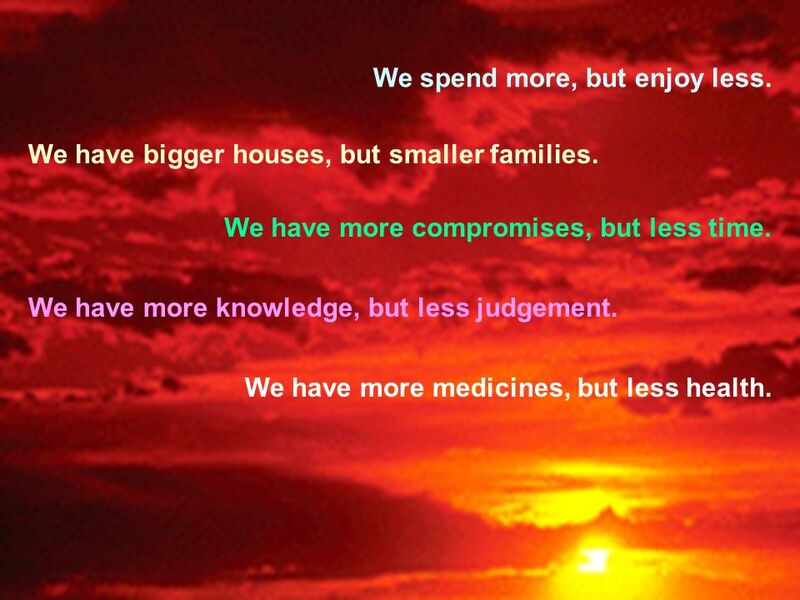 Paradoxes of Our Times Click for Next Slide  Today we have bigger houses and smaller families. More conveniences, but less time. 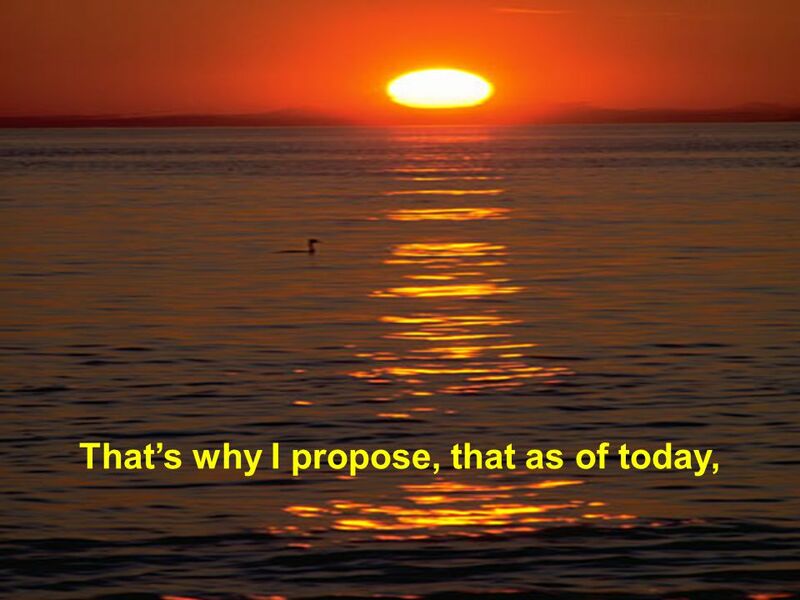 “13 Life Advises" 1 I don’t love you for what you are but for what I am when I am with you. Paradox Times Today we have bigger houses but smaller families, more amenities but less time.